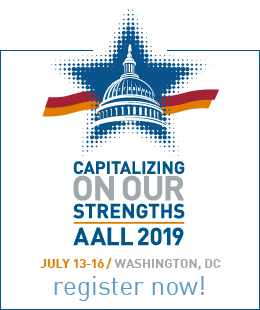 AALL is committed to providing opportunities for professional growth. Each year, the Association awards scholarships to assist individuals in meeting their educational goals in the field of legal information. Individuals should apply for all of the scholarships for which they qualify. The deadline for all scholarships is April 1. Scholarships are available to assist individuals studying to become law librarians as either a library or law school student, or to library school graduates seeking an advanced degree in a related field. Candidates should apply for more than one scholarship when appropriate. 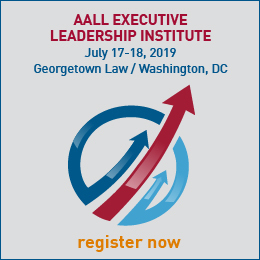 Preference is given to AALL members, but scholarships are not restricted to members. Applicants with law library experience are also given preference, but it is not required. Evidence of financial need must be submitted. Scholarship recipients will receive a lump-sum award, based on available funds and the number of awardees for a given year. A paid fellowship in a law library. The fellowship stipend will be awarded directly to the recipient in two installments. The first installment would be at the commencement of the fellowship and the second would be at its’ conclusion. Each fellow will complete a work syllabus or journal of their fellowship experience at a law library. The host institution will confirm the fellow’s participation and the completion of the fellowship. The information of their experiential learning would be submitted to the Strait Fellows Committee for approval before the final installment of the stipend award is distributed. Each fellow will select a host from a list of participating institutions. Each fellow needs to indicate (1) geographic preference, (2) type of law library (e.g., public, private, law firm, court, or corporate counsel), and (3) type of project or area of interest (e.g., public service, technical service, digital, information technology). The fellowship and the time commitment would be determined by the host institution and the fellow. However, the fellowship should be completed within a semester or four months, depending on the project. Each fellow will be assigned a mentor by the host institution. The fellows and mentors will meet and develop a partnering relationship. Mentors will assist and provide support to fellows as they begin their transition into the professional workforce. During the fellowship, a journal or a work syllabus will be completed by the fellow. The work syllabus or journal will be a 250-500-word self-reflection on what work was required in the way of projects and learned in the internship. Also, the fellows will complete a formal evaluation of the fellowship upon completion. Feedback from these documents will be shared with the host institutions. The fellowship, journal document, and formal evaluation are to be completed within one year of the original award.